TAKAMATSU, KAGAWA PREF. - A businesswoman is trying to preserve a 130-year-old tradition of glove making in her hometown in Shikoku by developing her own brand to reach a wider customer base. 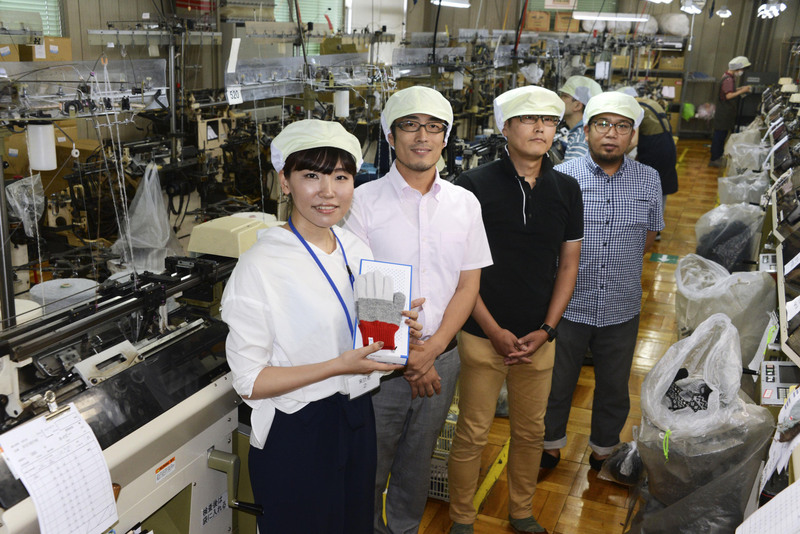 Higashikagawa in Kagawa Prefecture, the hometown of entrepreneur Fumi Matsushita, 31, accounts for about 90 percent of domestic glove production. However, the city has not been widely recognized as a top glove-making site because local manufacturers have mostly worked as subcontractors for major sports equipment companies. The local industry, which boasts a high concentration of makers of leather, knit and other types of gloves, has recently been threatened by the exodus of manufacturing bases to overseas locations and the aging of the city’s artisans. Matsushita, who worked in sales and merchandise planning at electronics maker Sharp Corp. until 2015, came back to her hometown to “return the favor” and set up her own brand, Tet., in the fall of 2016. Since then, she has expanded cooperation with local manufacturers and spread information about the local glove industry on social networks. Currently, it is primarily craftswomen in their 50s to 70s who sustain the glove production, which requires sophisticated sewing skills. As her brand is known for the beauty of its designs and functionality of its products, Tet. items have made their way onto the shelves of department stores in Tokyo and Osaka. Sales between April and July of the brand’s gloves and arm sleeves for sun protection doubled from a year earlier, and the number of local manufacturers working for Tet. is also expected to double to eight by the end of this year, from four when the company was established. “I hope the branding (of local gloves) provides a good opportunity for young people to inherit the tradition (of glove making),” Matsushita said.